Within the world of Grymoire, magical beasts known as Mirages roam the land, and people known as Mirage Keepers have the power to capture them and control them as their own. World of Final Fantasy puts you into the shoes of twins Lann and Reynn. Having lived a life in the peaceful Nine Wood Hills, the twins didn’t think anything was wrong with their lives. That is, until the day when they wake up to find no one in their town, save for one mysterious woman… and a crazy fox thing. These events will end up setting everything into motion to lead these two off on their adventure through Grymoire. 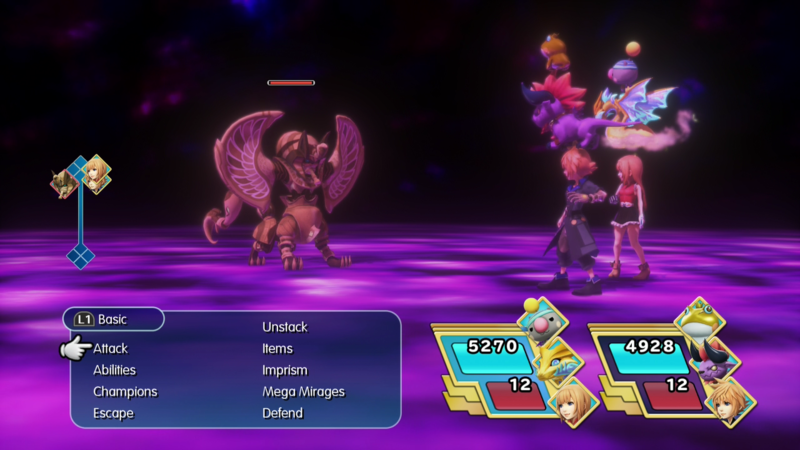 One of the easiest ways to explain what World of Final Fantasy is is that it’s Final Fantasy’s answer to Pokemon. There’s a ton of Mirages for you to go out and catch, you’ll work towards eventually evolving them, and you’ll level them up and learn new abilities. However, World of Final Fantasy is not Pokemon, and once you look past the surface you’ll find a whole host of differences. One of the largest differences between the two is that instead of using generic balls to capture your Mirages, you’ll use specialized Prisms. These prisms are set for each transfiguration (or evolution) chain, and you’ll be given one each time you encounter a new Mirage. Well, okay, so there is one generic type of capturing device, but this device is only used for capturing mechanical type enemies, and they have to be purchased. You can’t just go into a fight with Mirages guns blazing and hope to be able to capture it right away though. In order to be able to give yourself the ability to try and catch a Mirage, you’ll need to perform a specific task that can be found out by casting Libra on the target. This task can range anywhere from needing to simply hit the target with a physical attack all the way to needing to fight with a solo party member. Once you’ve created the opportunity – called a prismtunity – you’ll be able to start trying to Imprism your target. There’s no worry about running out of prisms here – you’ll only actually use the item once your Imprisming is a success. Outside of the Imprism mechanic, combat plays out in your typical turn-based system. All participants of the battle will move along the bar on the side until they reach the top. Once they’ve made it to the top, they’ll be able to do their turn. You can either set this to a Semi-Active, Active, or Wait system. Active will have the gauge constantly moving, even while you’re inputting commands, whereas Wait will pause it so that you can think out your turns. World of Final Fantasy features two options for how you’ll have your battle menu setup – Basic or Classic. Basic is pretty much what it sounds like; you’ll have four options to choose from (a couple abilities and attack) and the game will automatically choose your target for you unless you tell it otherwise. Classic is your Classic Final Fantasy combat menu, and I switched to (and stuck with it) after only a few battles with Basic on. The Classic combat menu feels like it gives you a ton more control, and you can freely choose whatever action you want. There’s also commands that are only available for you to use in the Classic menu, including the ever-important Item command. As you progress through the game you’ll run into a whole host of familiar faces from other Final Fantasy titles. The characters, known as Mediums in the game, are yet another key point in both the story and combat. As you meet these characters and go through the story, you’ll be given Champion Medals. Champion Medals are a special attack that require stars that will build up as you battle. These stars will cap out at three, and each medal will cost either 1 or 2 stars to actually cast. Each one has a special effect, though at the end you may find yourself defaulting to just using one or two of them (if you actually remember to use them). Using the Classic menu, I ran into the issue that I’d often forget about them since you can’t actually see your progress towards summoning one without being in the Basic menu (you can also check the main menu). It would have been nice if there was an easier indicator on the Classic menu for these, but all they simply did was make fairly easy battles even easier. As you collect Mirages you’ll need to set up what is known as Stacks in order to use them in combat. Stacks consist of three parts – a Large, Medium, and Small piece. Lann and Reynn can fill either the Large or Medium slot depending on if they are in Jiant or Lilikin form. Other than that, you’ll need to set up Mirages to stack up with them. As you set up these stacks, you don’t want to just set them up willy-nilly. You’ll want to plan them out so that you’ve got both a stable stack and abilities that line up well together. The thing is, until you level up your Mirages, you won’t actually be able to see how the stacks combine together for abilities unless you do some real digging. This was a bit unfortunate to me, as it would’ve been nice to have a reference list that I could go to so I could figure out how to best optimize my Stacks. 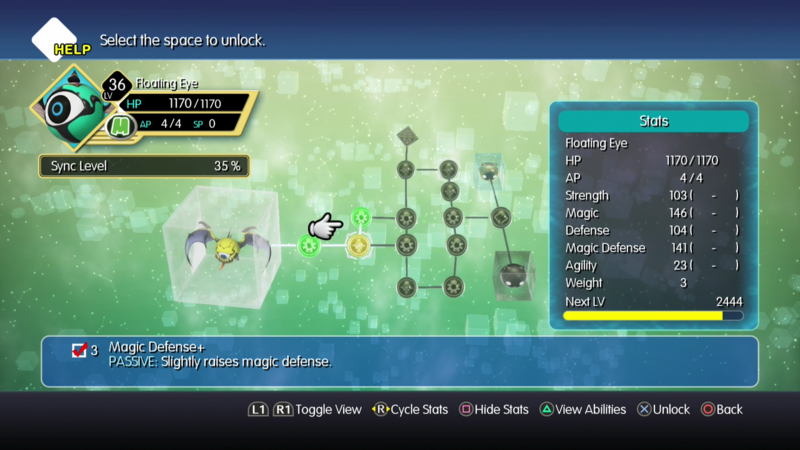 In order to upgrade your Mirages, you will need to delve into a system that is extremely similar to what was found in Kingdom Hearts 3D: Dream Drop Distance. Each Mirage has a board, and these boards are setup per Mirage. As you go into their board, you’ll see boxes where each of their Transfigurations will go, and you can also go and learn skills from said Transfigurations without actually switching to them. Well, unless it’s a board that takes you into a completely different transfiguration line. You will gain AP as you level up, and this AP is used to learn abilities from the board. Each node is indicated by what type they are in the infobox associated with them. As long as you are within a single Transfiguration/Evolution line, you will gain the benefits of any node that says Passive on it, regardless of what form you are on. While the upgrade system is fairly simple, there will be a lot of depth that will go into figuring out how to best level up your Mirages. Dungeons will play out as your typical dungeons – treasures, lots of paths to go down, and yet some general linearity. There are a number of sidepaths you can hit up that will typically involve you doing a puzzle to solve. These puzzles will either ask you to have a certain weight and resistance combination, or to have a Mirage with a certain ability so that you can get past (or over) an obstacle. Having the Mirages I needed for these puzzles ended up reserving most of my party slots to cover them, which resulted in me not wanting to change too many at a time. If you want to take a break from the main story, there are a number of side things you can go do. The Coliseum will let you pit yourselves against a large variety of creatures, typically ones that you have encountered previously, or ones that are just basic setups like “FF Classics”. 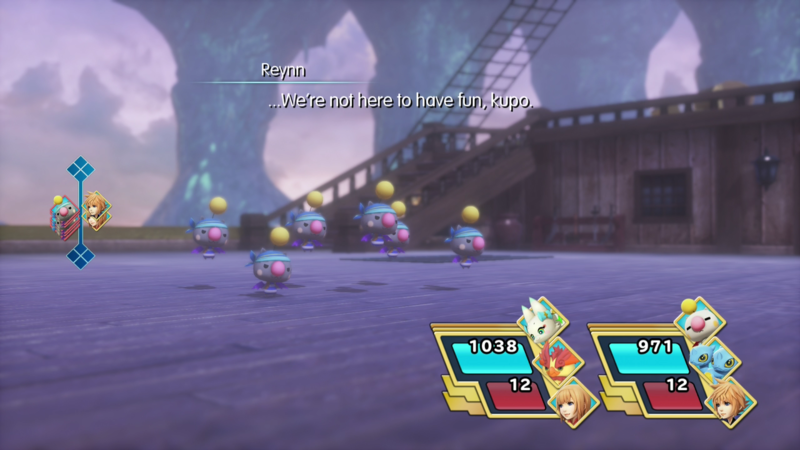 There’s Intervention battles which allow Lann and Reynn to step into a moment in time that the Champions are taking part in to aid them in a battle (without them actually knowing). Then there’s regular side quests (or “Miniventures”) which consist of fetch quests and “Kill X enemies”. Overall, the game’s script is fairly good though you’ll run into quite a few cringe-worthy moments with Lann being the biggest offender in his attempts at comic relief. 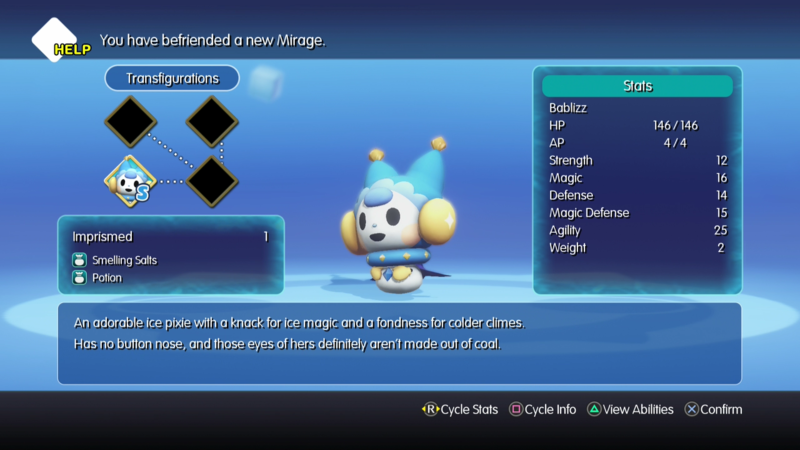 The descriptions for Mirages also have a tendency to break the fourth wall (“During World of Final Fantasy’s QA testing…”). Despite this, the cheesiness just works. 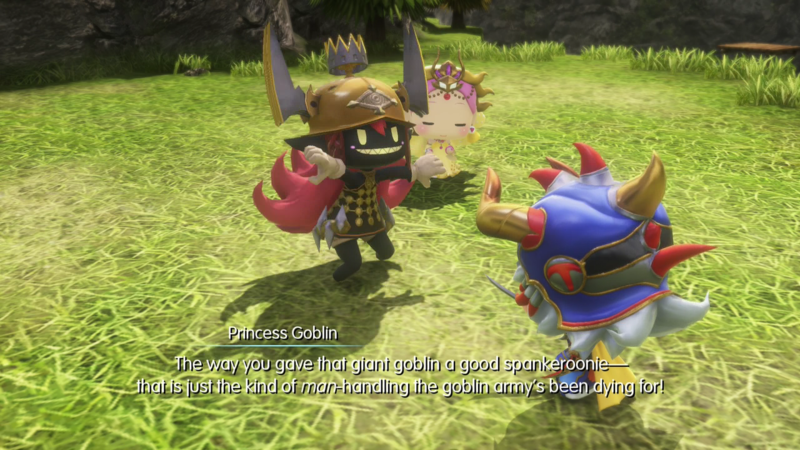 World of Final Fantasy completely runs with the fact that it doesn’t take itself seriously, and that is perfectly fine with me. Do I recommend World of Final Fantasy? Yes. If you enjoyed the classic Final Fantasy games you will find a lot to love about this game. The game does have two major downsides to me. The combat system was a bit too easy, often being completely crushed by just using a few items. There’s also the biggest issue of the fact the game only features one save slot. That’s it, you only get one save. Want to start up a new file? You’ll have to overwrite. I get that they were going for the Pokemon style here, but they didn’t need to copy that part of Pokemon. Regardless of that, I still give the game a very easy recommendation to any Final Fantasy fan. World of Final Fantasy is available now on Amazon for PS4 and Vita, as well as on PSN for PS4 and Vita. I would like to thank Square Enix for providing me with a PS4 copy of the game for review purposes.